We’d love your help. Let us know what’s wrong with this preview of Well, That Was Awkward by Rachel Vail. Gracie has never felt like this before. One day, she suddenly can't breathe, can't walk, can't anything and the reason is standing right there in front of her, all tall and weirdly good-looking: A.J. It turns out A.J. likes not Gracie but Gracie's beautiful best friend, Sienna. Obviously Gracie is happy for Sienna. Super happy! She helps Sienna compose the best texts, res Gracie has never felt like this before. One day, she suddenly can't breathe, can't walk, can't anything and the reason is standing right there in front of her, all tall and weirdly good-looking: A.J. It turns out A.J. likes not Gracie but Gracie's beautiful best friend, Sienna. Obviously Gracie is happy for Sienna. Super happy! She helps Sienna compose the best texts, responding to A.J. s surprisingly funny and appealing texts, just as if she were Sienna. Because Gracie is fine. Always! She's had lots of practice being the sidekick, second-best. To ask other readers questions about Well, That Was Awkward, please sign up. how was this book so good? It was AMAZING!!!!!! Is there going to be another one? The end was such a cliff hanger. Loved this book. Rachel Vail's characters, adults and children alike, never fail to come alive on the page. And the tiny little age-appropriate romance made me so happy! Well, That Was Awkward is one brilliantly funny, very clever, unputdownable, grin-worthy absolute blast of a book. Oh my gosh, I loved it so. Well, That Was Awkward is a charming loose retelling of Cyrano de Bergerac ~ always a fun premise to remake for teens of today ~ who are texting and emoji-ing all over the place. It's a real feel-good story with delicious puns, quick witted humour, a tortoise (and a rabbit), a suddenly cute boy, best frien Well, That Was Awesome! 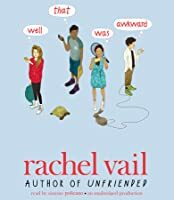 Well, That Was Awkward is a charming loose retelling of Cyrano de Bergerac ~ always a fun premise to remake for teens of today ~ who are texting and emoji-ing all over the place. It's a real feel-good story with delicious puns, quick witted humour, a tortoise (and a rabbit), a suddenly cute boy, best friends, epic inside jokes (Never. Gonna. Happen. ), and the perfect amount of depth to flesh out all the characters. The characters are in grade 8 and they are perfectly awesome. Oh, and the parents were also complete classics! I love when parents are just as funny and original as the teen characters (shout out to all you awesome parents out there! Haha). True to the title, there were many hilariously awkward moments, so this should be your next read when you're in the mood for some LOLs (haha). I seriously loved this ~ it's a perfect blend of some of my fave things in fiction: light-hearted fun with the perfect amount of angst, awkward shenanigans, characters who are my people, and a plot which builds in anticipation to a sweet. sweet climax and charming and cool resolution. THE BEST. I laughed, I cried, I want a sequel. Ruby Oliver fans will love this. I think that a possible theme could be to support others even if it means that you won't get what you want. This book shows how hard middle school can be, and how much drama takes place. Also, even though Sienna and Gracie are good friends, Sienna gets the guy that Gracie likes but Gracie still helps Sienna out. Even though Gracie is going through a lot, she tries to act like she isn't. Well, that was adorable. Funny, so relatable, and heartwarming. I can't wait to give this to some of my middle schoolers. I want to see more of these characters! Rachel Vail writes some good characters! This could have been a cute, Cyrano de Bergerac type middle grade romance, and it would have still been good! But Vail added a layer of depth: Gracie and her parents are still dealing with the unexpected death of a child, years before Gracie was born. This adds interesting interactions between Gracie and her parents, as well as Gracie and her peers. The story arc was somewhat predictable, but that didn’t make this any less of a sweet, enjoyable read. Great story of friendship, family and first love. Sweet junior high story about friends, friendship, pre-dating, bullying, belonging, family, and loss. Vail is quite the wordsmith, and she is adept at teen-talk, including texting between characters. Think of this as at the early end of Jennifer E. Smith books--same audience, just months before. Now I need to read Unfriended! A portrayal of romantic life that’s appropriate for upper elementary readers narrated by a voicey, nerdy main character who is a little too quick-witted to be realistic. AJ likes Gracie’s best friend, Sienna. Shy Sienna isn’t sure how to respond, so Gracie writes Sienna’s texts to AJ. I appreciated that this book had a premise that was appropriate, realistic, and appealing to both elementary and middle school students -- first crushes, first kisses, puppy love, and a lot of awkward A portrayal of romantic life that’s appropriate for upper elementary readers narrated by a voicey, nerdy main character who is a little too quick-witted to be realistic. I appreciated that this book had a premise that was appropriate, realistic, and appealing to both elementary and middle school students -- first crushes, first kisses, puppy love, and a lot of awkward. However, I found the message, packaging, and pacing to be a little bit off as compared to the plot. I found the premise appropriate for readers in grades 4 and up, while the voice, the nerdishness, the punning, the pacing, and the sense of humor is closer to the maturity of a YA. That is to say, I think a lot of young readers who could find this book appealing won’t, because it’s about 100 pages too long and the character seems too wise to be relatable. I’d give this book to fans of books like Rebecca Stead’s Goodbye Stranger for a few reasons. Both have smart female characters who are witty, wise, and totally middle school. Both take place on Manhattan’s Upper West Side. I do so enjoy a smart love story. This ranks right up there with my faves. It's lighter than Eleanor & Park, but just as swoony. It's as sweet and funny as Simon vs. the Homo Sapiens Agenda, but unlike with Simon, there's really no surprise as to who Gracie is meant to fall in love with. And that's okay. Gracie's clever, somewhat manic internal monologue is endearing and pulled me through the story even though I knew pretty much all along what the payoff would be. This is a feel-good story w I do so enjoy a smart love story. This ranks right up there with my faves. It's lighter than Eleanor & Park, but just as swoony. It's as sweet and funny as Simon vs. the Homo Sapiens Agenda, but unlike with Simon, there's really no surprise as to who Gracie is meant to fall in love with. And that's okay. Gracie's clever, somewhat manic internal monologue is endearing and pulled me through the story even though I knew pretty much all along what the payoff would be. I love this book for middle school and up. Lighthearted but deals with some tougher topics in Gracie's life. I enjoyed reading it! Yet another really good read from the 2018-2019 Lone Star list. This is #6 or 7 for me to read and so far, I have not been disappointed. I would call this one like John Green or Sarah Dessen for middle grade readers. It was sweet, funny, angsty, and ultimately hopeful. I really liked it. I thought this book was very well written. It showed the real humor and struggles of the middle school experience. There were a lot of relatable moments and it showed its ok to feel. I would recommend this book to anyone who loves realistic fiction. This was a pitch-perfect Middle School/MG read. Characters with depth and interests outside of the plot, a sweet romance, romantic entanglements without tons of physical stuff - lovely. Hard to do! Gracie likes AJ. At least she thinks she does. The problem is that Riley also likes AJ. Meanwhile, AJ likes Gracie's best friend, Sienna. It's all a big awkward mess. Gracie, AJ, Sienna, and Emmet have always been best friends, but one day things change. AJ and Sienna start dating. Now with the whole support of the "Loud Crowd" behind them. Gracie has to figure out her feelings fast, or things will end in disaster. Does she like AJ and tries to hide her feelings from Sienna? Or does she like Emm Gracie likes AJ. At least she thinks she does. The problem is that Riley also likes AJ. Meanwhile, AJ likes Gracie's best friend, Sienna. It's all a big awkward mess. Gracie, AJ, Sienna, and Emmet have always been best friends, but one day things change. AJ and Sienna start dating. Now with the whole support of the "Loud Crowd" behind them. Gracie has to figure out her feelings fast, or things will end in disaster. Does she like AJ and tries to hide her feelings from Sienna? Or does she like Emmet who she's known and supported for almost her whole life? I thought this book was very well written and a delightful read to finish my spring break reading. I especially loved the characters and how well they were written. It. reminds of how well authors make their characters human, rather then their characters being robots without emotions. Another reason why I loved this book is that it was just a normal book about middle school life. It was nice to have a break from dystopian and fantasy. The reason why I gave this book 5 stars is that it was a perfect, little nice book with tons of situations that could potentially happen to anyone in middle school. Overall, it was a very cute book with tons of messages of what to do in awkward situations. Well, That Was Awkwardof a diverse group of middle schoolers embarking on their journey to high school. Gracie Grant, a tall eighth grader who has a prominent nose and hails from New York City, takes the lead as our Cyrano figure. She is bubbly, plucky, and optimistic. Gracie's best friend, Sienna Reyes, needs help texting the boy who likes her, the handsome AJ Rojanasopondist. Though nursing a broken heart, Gracie puts aside her feelings and is completely there for her best friend. T 4.5 stars! Well, That Was Awkwardof a diverse group of middle schoolers embarking on their journey to high school. Gracie Grant, a tall eighth grader who has a prominent nose and hails from New York City, takes the lead as our Cyrano figure. She is bubbly, plucky, and optimistic. Gracie's best friend, Sienna Reyes, needs help texting the boy who likes her, the handsome AJ Rojanasopondist. Though nursing a broken heart, Gracie puts aside her feelings and is completely there for her best friend. Text messages are sent and their meanings are flustered over. Despite having feelings for AJ, Gracie has no idea that someone is actually interested in her. The romance in this book is adorable as the characters try to find their own voices and personalities as they come to terms with their own shortcomings. It made me thankful that I will never have to relive those awkward moments ever again. Well...That Was Awkward by Rachel Vail was one of the best books I've read so far. I would say that this book would capture the attention of mostly teenage girls. The main character is Grace. Grace is a highschool student who makes friends wherever she goes but has a family loss that is getting harder to avoid. She has 3 friends that always have her back. But since they are older and are becoming teenagers, drama starts unfolding between crushes, school, and the school bully. 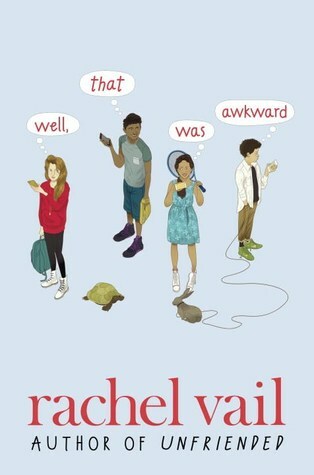 I rated this 5 stars Well...That Was Awkward by Rachel Vail was one of the best books I've read so far. I would say that this book would capture the attention of mostly teenage girls. The main character is Grace. Grace is a highschool student who makes friends wherever she goes but has a family loss that is getting harder to avoid. She has 3 friends that always have her back. But since they are older and are becoming teenagers, drama starts unfolding between crushes, school, and the school bully. It can be hard to find books that really fit kids in middle school (MG books often seem too young for them and some YA choices are too mature), but this is a great book for 11-14 year olds and up. It's witty and fun. I appreciate that it deals with a common real life experience of early romance during these grades (a sudden crush and the behind-the-scenes negotiations that often ensue) but also has a poignant family story line that was really touching. Nicely done! Ohmyword, I loved this book. LOVED. I read multiple sections to my husband after he caught me repeatedly laughing out loud, and I made a date with my 11-year old to read it together this summer when we do a little pre-middle school road trip. Because Gracie is the kind of friend you want your kid to find. Charming novel about first crushes, filled with humor, wisdom. and compassion. I laughed out loud several times, and teared up too. In the same vein as Criss Cross, but in modern NYC. One the best takeaways for me? When Emmett replies "show your work" to Gracie's patently untrue, "I'm fine. I'm always fine." Isn't that a lovely way to challenge a friend? If you like realistic fiction with a little bit of romance, this book is for you. I love Rachel Vail's books, and this one was amazing. All I wanted to do was keep reading it. You become very connected to the characters, and its really fun seeing what happens next. I defiantly recommend this book to everyone! Even if it is not your favorite genre. This was a really cute retelling of Cyrano de Bergerac. While Rachel Vail didn't nail the voice of a middle schooler, it was still close enough to be enjoyable and there were a couple of really moving scenes. Oh my goodness, I laughed, I cried, I read it aloud to co-workers, I even texted lines to friends because they made me laugh out loud. I will most definitely be recommending this to many of my students and reading Unfriended now - this is the current book to beat for the year! Some details, I do know-I was very into reading and theater, so I read every book I could get my hands on (especially realistic fiction, either contemporary or historical) and took acting workshops and auditioned for every play in school, camp, or the community. I played Peter Pan, Miss Hannigan in Annie, Benny Southstreet in Guys and Dolls, the Scarecrow in The Wizard of Oz, and lots of extremely memorable chorus parts-for instance, I was "girl number two" in Fiddler on the Roof-the one who said "We heard about your sister, Chava". I didn't care -I just wanted to be on stage. Waiting backstage before curtain call, after giving my all in a performance, was the best feeling I knew. In seventh grade I started taking magic lessons, and by eighth grade I was making all my own spending money by performing at kids' birthday parties as a clown named Tallulah. I liked the freedom of wearing all that grease-paint-I could be as wacky and un-cool as I wanted. I tried dance but felt so clumsy. I faked a sprained ankle to get out of the recital. I took voice lessons which made me a little light-headed (and I was afraid of the voice teacher's growling, drooling Doberman) and both saxophone and piano, neither of which I ever practiced. I did well in school but started a lot of my work at the last minute, in a crazy mad dash, so that it was never late but there were usually careless errors or areas I had to fudge. I had this idea that to work hard at something was sort of a negative, an admission that I didn't have natural talent. If I wasn't going to be Mozart and have the music (or dance, or math, or social studies term paper, or whatever) channeled through me from God, then I was just embarrassing myself by all that workmanlike effort. I didn't get over that idea until after college, by the way. I never really planned to be a writer. I planned to be a financial wizard after learning about option-spreading at age 10, then a poet after discovering Shakespeare at 11. After overhearing "the real power is held by the lobbyists" on a class trip to Albany, I planned to become a lobbyist. Secretly, of course I always imagined myself as an actress, but that didn't seem hard or important enough, and also I worried I wasn't naturally gifted enough. My parents were always great. I liked to make them proud, and they trusted me and supported my efforts and interests, which was sometimes weirdly tough. There was so little for me to rebel against. When people ask me what I was as a kid, I always feel like my answer is at best incomplete.What are you like, as a kid? I'm still trying to figure out what I'm like as an adult. Well, things went in waves. Sometimes I felt very "in", very aware of and tied in to the whole scene, excited by who liked whom, all the gossip, some of it less than kind. Other times I felt so alone-like there was nobody like me, nobody who liked me, nobody to talk to. And much of the time it was somewhere in between. A best friend when I was lucky, and a few people in each crowd I liked and who liked me. I resisted being classified as a brain or a jock or alternative or popular-too limiting. I would have to shut down too many parts of myself to be just one type. I went through a very intense stage in middle school (Junior High). I worried about being too ordinary. I also worried about being too weird. I also worried about changing states of matter, my inability to be morally certain, ignorance (my own and world-wide), and making a fool of myself.